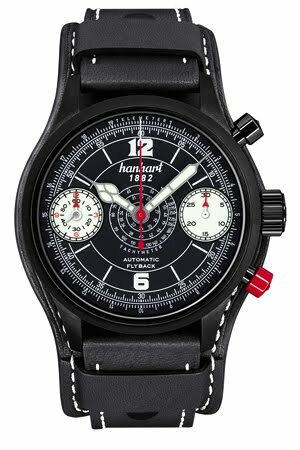 To mark its 130th anniversary in 2012, Hanhart is launching two limited versions of the Pioneer Stealth 1882 (each limited to 130 pieces), which takes its name from the stealth technology used in aviation and reproduces all the characteristic elements of the legendary Hanhart pilot’s chronographs from the 1930s in an eye-catching contemporary design. 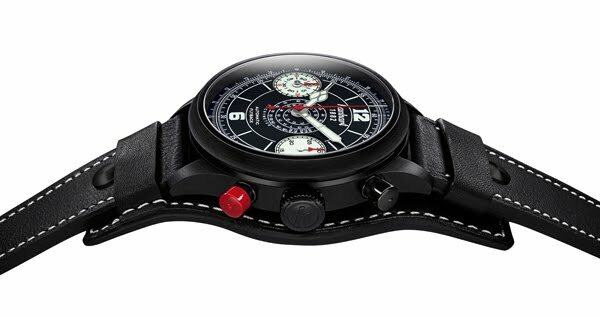 Enclosed within its gleaming, velvety black case is an exclusively modified chronograph movement, which features increased spacing between the two displays at 3 o’clock and 9 o’clock, an integrated hour counter in the small seconds and a flyback function. The dial also offers practical tachymeter and telemeter scales, with designs reminiscent of the traditional Hanhart “Tachy Tele” model from 1939.